The action was taken after Express reported on October 6 about the illegal building. CHENNAI: Revenue officials on Wednesday demolished an illegal building that had encroached on a land near the Perungudi MRTS station, which acts as a natural drain for rainwater flowing into the Pallikaranai marshland. The action was taken after Express reported on October 6 about the illegal building. 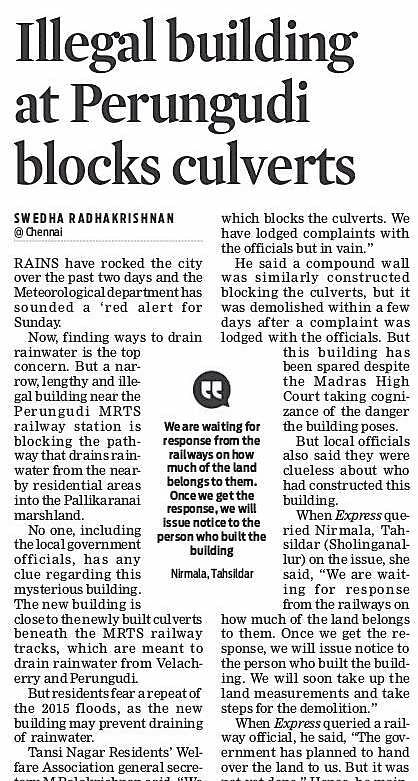 The local residents feared that the building would block the draining of the rainwater from the Velachery and Perungudi residential areas. “A few more buildings are yet to be demolished as the building owners asked for time to vacate. But the roofs were demolished,” said M Balakrishnan, a resident of Velachery. “After struggling for months, we have got a permanent solution. We have never expected immediate action,” aid Anand K, another resident of Velachery.